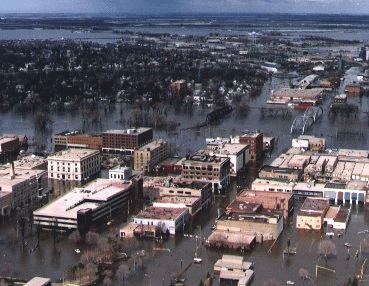 The story that follows was written by a Grand Forks resident on May 7, 1997, two and a half weeks after the flood forced him to leave the city. He sent copies to members of his family and to other people he knew. It is May 7, 1997 and I am going to try to write about my personal experiences in the terrible flood of 1997. It is cold here in Arthur, No. Dak. but I hope I can concentrate and get this down on paper. 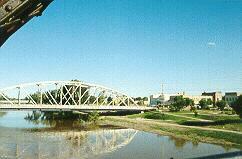 I don't remember when the Red River reached flood stage here at Grand Forks, N.D. But I do remember walking downtown to watch the river rise under the Sorlie Bridge. Then on Wednesday April 16, 1997 everyone talked about an impending crest of about 49 feet. Well, that noon I heard there had been a flood surge at Crookston, Minnesota and it was expected in Grand Forks late Thursday or early Friday. Well, I had gone to the bread store near 20th St. and Highway 2. When I was done there I walked back uptown and went to 3rd Street and followed the bike path. The water was lapping near the top of it. So I stopped near downtown a ways from the old N.P. Railroad Bridge (the walk bridge now). I told some people about the Crookston flood surge. And two men from south of Wahpeton said that isn’t the least of your problems, they opened the flood gates on Lake Traverse in South Dakota and sent a 5 foot wall of water down on Wahpeton. And it was expected to reach Grand Forks Saturday morning and we were under a waxing full moon. A waxing moon means that it is before the high point before going to regression (waning). Well, when the waxing occurs the moon has greater power to lift tides. And this has an effect on water to draw it up. and downtown Grand Forks, July 1997.